One of the best memories I’ve shared with my in-laws so far is sitting elbow-to-elbow around a crowded couch in their basement, soda cans and napkins sprawled all over the coffee table, everyone eating pizza. All 9 of us. John has six siblings and he’s the oldest, and every time we get together with his family we joke that it’s like chasing a tornado. You don’t know where it’s headed and how long it will stay and everyone seems to be pulling to go their own direction at every turn. Thankfully they’re not the destructive tornado type, more the “come in make things a little messy and love on you” type. The kind I prefer. One thing John’s family does very well is pizza. One of the best times I recall was on one of the kids’ birthdays. The birthday boy got to decide what was for lunch and he picked pizza – smart kid. In true Shultz style we all made our own personal pans since the chances of 9 hungry bellies agreeing on one flavor was slim. I’m OK with that. I’m a “heavy on the sauce, pile on the veggies, light on the cheese” type. John loves pepperoni, lots of it. Abby prefers more adventurous types like BBQ chicken, and the other half of the group seems to be all about the cheese. Clearly, personal pans were the best option. So we all crowded into the kitchen, narrowly missing each other at each turn, flour covering the counters, each one pulverizing his or her own plot of dough. Sauce and spoons left red little dots everywhere and stray cheese and toppings looked like edible confetti exploded all over the floor. Twenty minutes later our (very) personalized pizzas were out of the oven, onto plates and under the weight of swiftly-moving knifes and forks working feverishly to cut fresh slices before the cheese lost its elastic stretch. Andy Griffith was on, eyes glued to the screen when not shoveling in steamy bites of pepperoni and veggies and crust. Amidst the chaos I couldn’t help but look around and feel thankful that I was a part of this little group, this family. A lot of people complain about their in-laws, and maybe rightfully so, but I kind of have it good. Any family that does personal pan pizzas and soda on a Sunday afternoon is the kind of family for me. Typically I prefer a very standard veggie pizza, but after buying some goat cheese and flat breads for another recipe I couldn’t help but do a little experimenting. 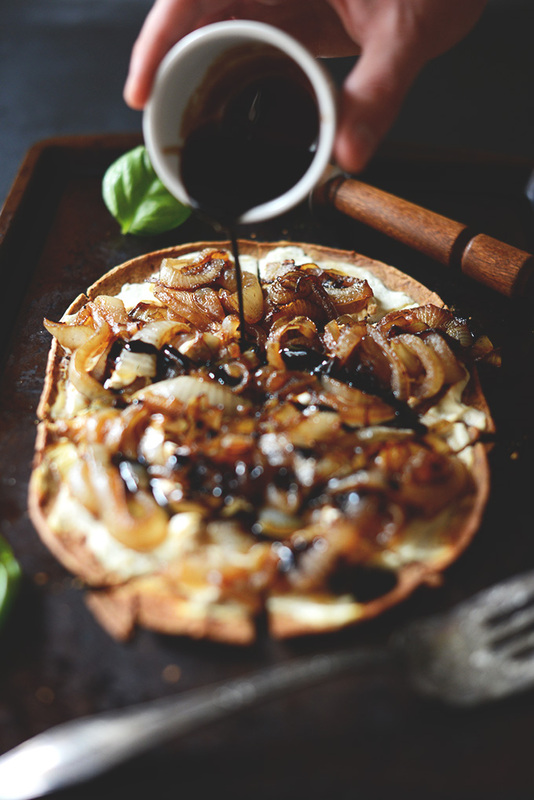 A simple, flavorful flatbread-style pizza with goat cheese, caramelized onions and balsamic reduction. Preheat oven to 400 degrees F (204 C) and position a rack in the middle of the oven. If using a pizza stone, place the stone in the oven as it preheats. Sauté onion in butter or olive oil over medium heat until soft, stirring frequently. Season with salt and pepper. Cover to keep in the moisture if they begin to look dry – add a splash or two of water if they’re getting too brown. Set aside once cooked. 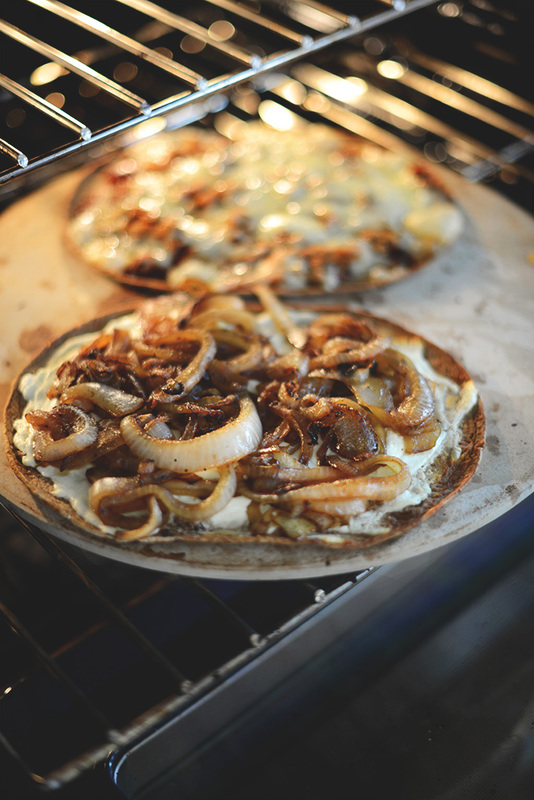 Once oven is preheated, brush flatbread with olive oil and place on the pizza stone or a baking sheet and “pre-bake” to crisp for about 5 minutes. 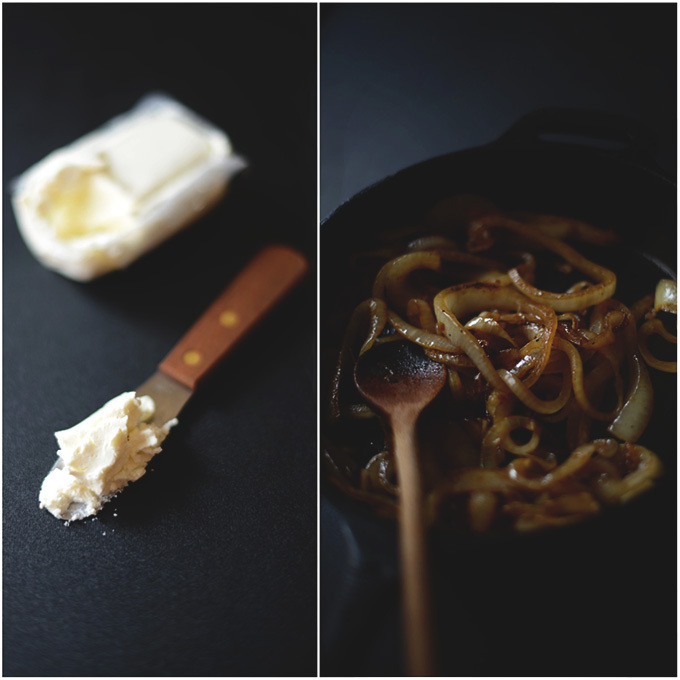 In the meantime, spoon goat cheese into a bowl and add a splash of milk or water to thin so it’s spreadable. Whisk until smooth. 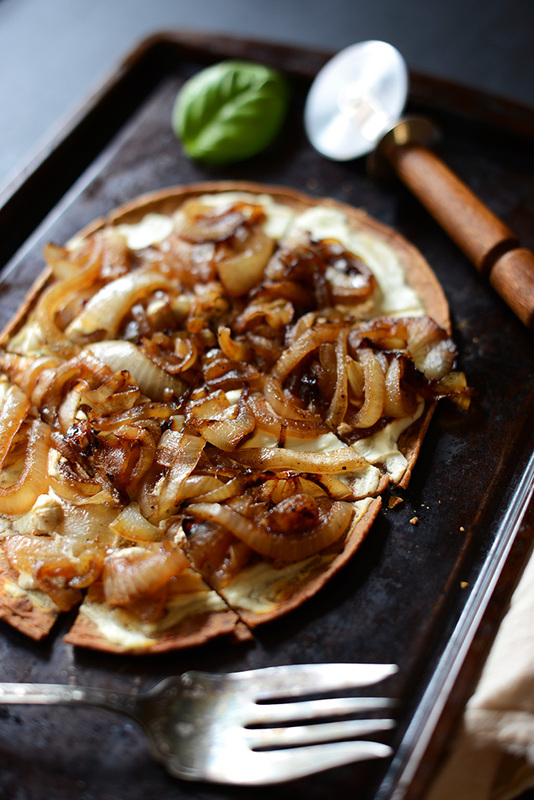 Remove flatbread from oven and spread with goat cheese and top with onions – I used all of the onions but use less and reserve the leftovers if you prefer. Place back in the oven and bake for 10 minutes, or until the edges appear crisp and the onions and goat cheese have warmed through. Slice and serve with desired toppings. I opted for a balsamic reduction and fresh basil. *Nutrition information is a rough estimate for 1/2 the pizza using a FlatOut whole-grain wrap for crust. Absolutely loved this recipe. I didn’t want to decide between arugula and basil so I added both. I will definitely be making this again. No, it is not. Sorry for any confusion! Some of the older recipes on our site are vegetarian, but not plant-based. All newer recipes are plant-based. I used a pizza stone, followed the preheating instructions and prebaked the flatbread for 5 minutes. The namebrand flatbread came out super hard, barely able to cut it. The flavors were great, but the crust was horrible. I’m going to try again, maybe not prebake. Do you think spinach would work with this receipe? Should I sautee the spinach? I think that would be a delicious addition! You could either sautee, or simply sprinkle it on top! For some reason it will only let me put 3 stars but it’s DEFINITELY a 5!! I had to modify this recipe so I could use what I had on hand. I used French bread, so this turned out to be a very individualized meal, similar to mini pizzas. On half of the mini pizzas I used thinly sliced tomato (thin, so they would warm up within the suggested amount of time). I topped all pizzas with balsamic glaze and whole basil leaves. They were delicious, and I am certain the original recipe tastes just as wonderful. I will make this again! 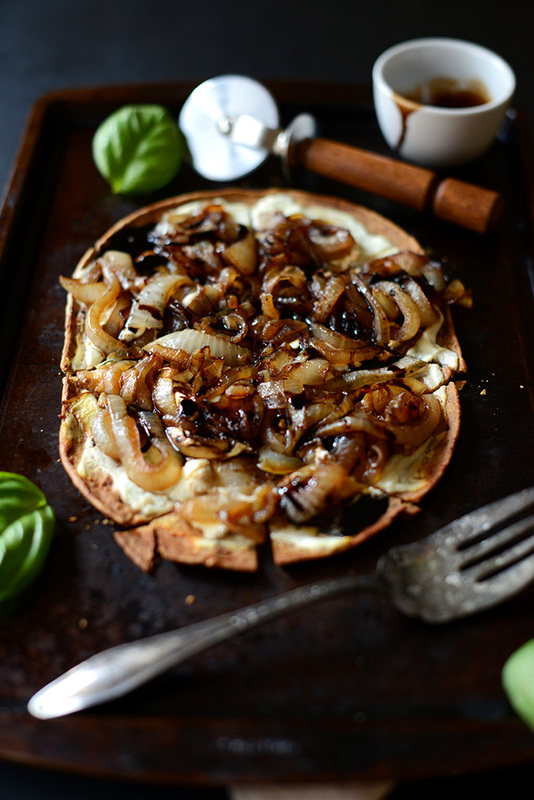 The changes I want to make next time: cut the onion rings in half (to make the eating process less messy), and tear the basil and combine with the goat cheese (so it is part of the spread and won’t fall off the top of the pizza while taking a bite). Sounds delicious! Let us know how it goes in the smoker! I made this today and loved it. I made exactly as receipt with one exception; I added mushrooms whice are 0 smart points. Really gave it a meaty flavor. I used to make the same thing years ago; same flatbread too. I loved the caramelized onions. And the goat cheese is so good. I did find a vegan alternative that is just as good and will use it. Made this last night and it was AMAZING!!! I did add an Arugula & Basil salad on top and drizzled the balsamic vinegar reduction on top. Perfection :) I love…LOVE your recipes! I have tried six so far, and all of them have been outstanding! Great flavours. I make this with a soda bread base. Still very few ingredients and very quick. Just knock up your soda bread dough and roll out as quickly as possible and continue as per this recipe. This pizza was perfect; it was last night’s dinner and I’m making it again for tonight. There were no survivor slices. I love the site and was looking for recipe. I stubble on the pizza until I saw Goat Cheese! Am I missing something. I just made this. It was really good. I wish I had the balsmic vinegar I was out. I was also out of fresh basil so I topped with fresh chopped spinach. I also used my homemade pizza crust. Can’t wait to try it again with the balsamic. This was fantastic!! My wife and I loved it. Thank you so much for sharing. We made something very similar last night, but with fig spread. So relish. We also made your watermelon margaritas and the grapefruit spritzers… Yum! Thanks for sharing all your wonderful creations! Awwww, what a great story. Jason and I are a family of 10 (parents, grand children, spouses, etc.) so it can get quite crowded here too. Thankfully, we don’t make personal pizzas – we just eat what we’re served. 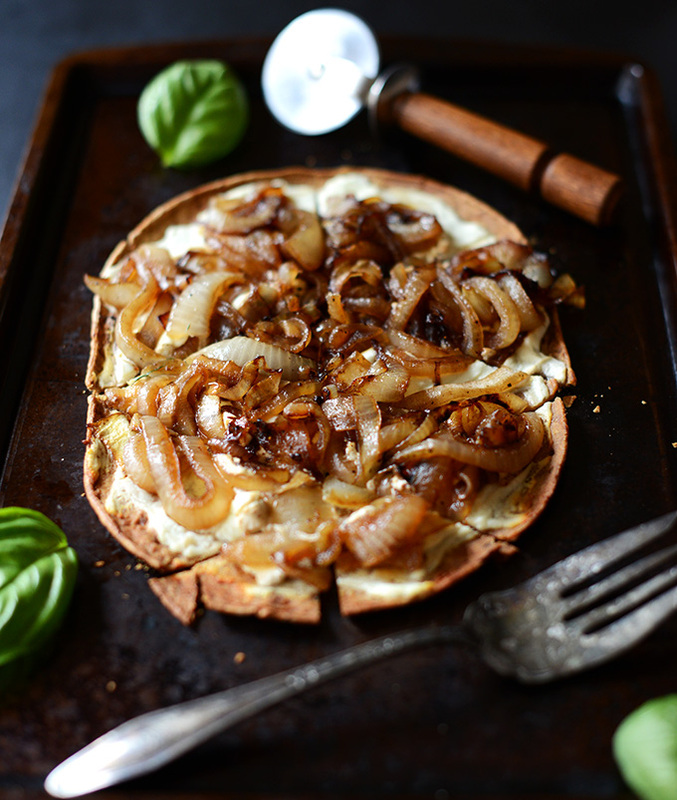 No, but really, this caramelized pizza is the best. And I can’t resist anything involving goat cheese! This looks amazing. It looks like my platonic ideal of pizza. And the photos of heaven. Wow this is totally mouth-watering! I’m with you on all of it – I LOVE pizza and I’ve been wanting to branch out lately! this just made it’s way to the top of next week’s menu! 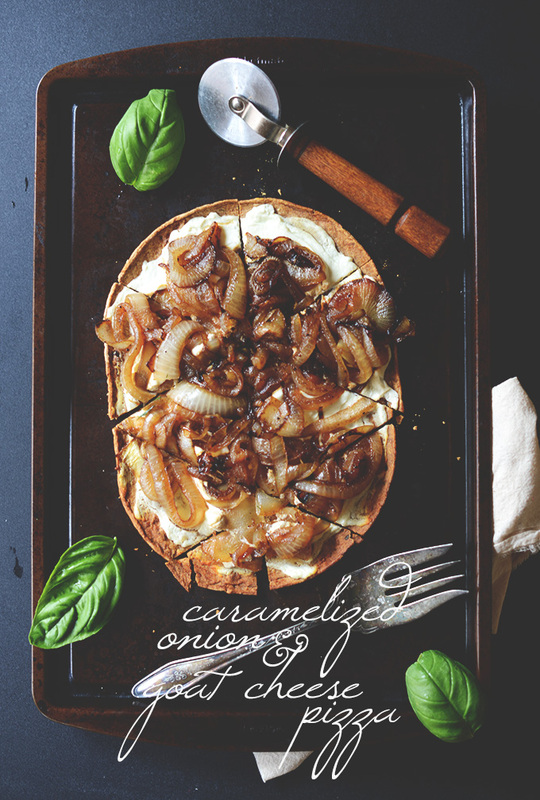 Goat cheese and caramelized onion are my favourite combo on pizza! Love the balsamic glaze-nice touch! This pizza looks so good! 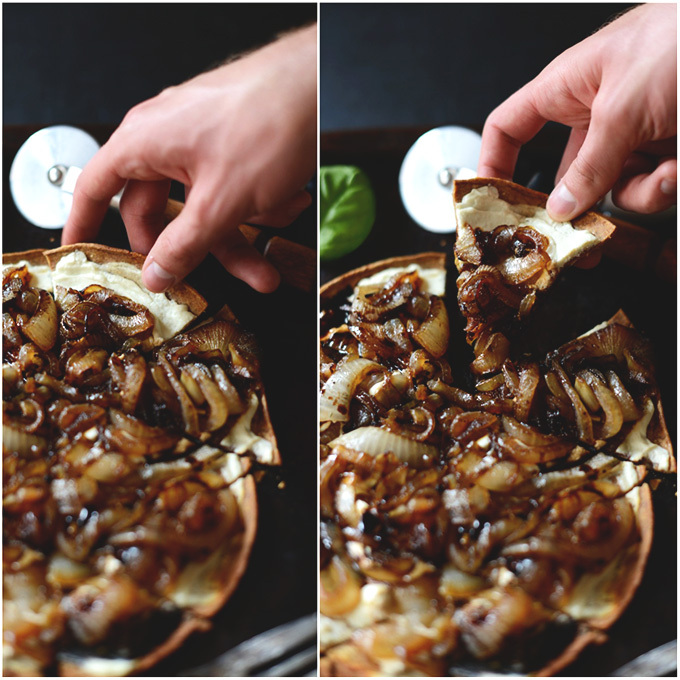 I am totally in love with caramelized onions. Good thing it’s personal sized because my family would never go for it. I can just make them “boring” pizza. I am on of 7 so I totally no what you are talking about with the elbow to elbow eating and full on craziness. It is fun though! I love this pizza. 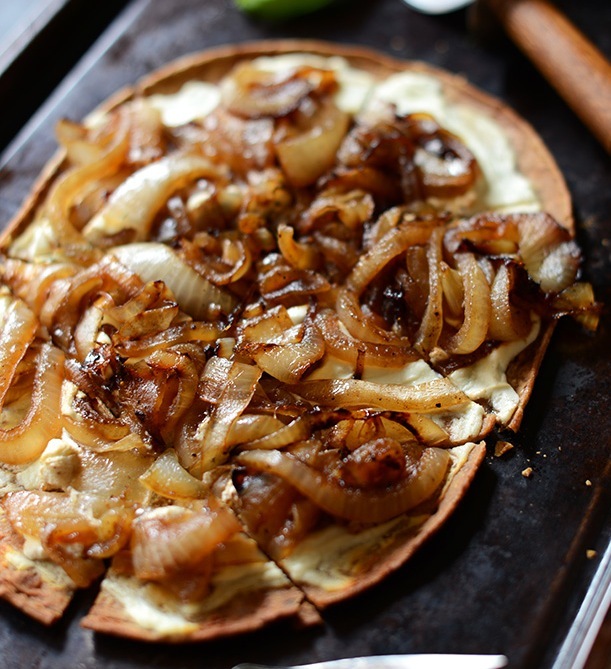 Caramelized onions are so good an typically the only way I really enjoy onions. Plus, I really love the basil and balsamic drizzle. YUm! Oh my goodness, what a huuuuge family! I can only imagine how much fun that must have been growing up. Also, this pizza looks magical! That pizza looks absolutely delicious. I’m all about the caramlized onions. Raw onions just don’t do it for me anymore after I started caramelizing the onions.